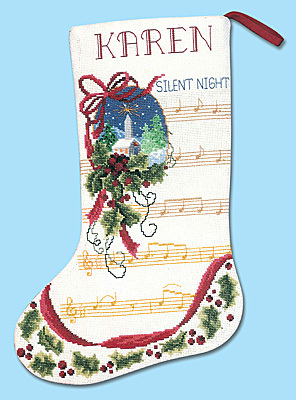 An elegant stocking you'll be proud to give as a gift or see hanging on your mantle every holiday season. Each kit includes 14-count white aida, 6-strand cotton floss, metallic thread, backing fabric, ribbon, needle, chart and instructions. Finished size is 10" x 15.5".